You must be a member of the Madrid Explorers Group to attend this activity. Would you like to join this group? 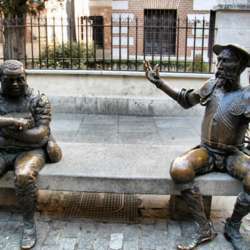 Next February 3rd (Sunday) you’re invited to discover -from different approaches- one of the most beautiful, historical and visited towns -and its surroundings- nearby Madrid: Alcala de Henares (the ancient Roman city of "Complvtvm", the Muslim fortress of "Alkal’a Nahar"), place of birth Protected content Miguel de Cervantes, “principe” of the Spanish language as author of one of the finest works of literature in the world: the immortal jewel masterpiece of "El Quijote" Protected content . ---“LOS CERROS” NATURAL PARK Protected content 3h15’ (round-trip to the Muslim fortress of "Alkak’a Nahar", also known as “Alcala la Vieja”/”The Old Alcala”) walking and breathing clean air between “cerros” (small mounts), pine forests, caves, stork’s nests and even -on the return route- moving along the right bank of the Henares, walking by a narrow -but enough safe- “hanging” path over the course of the river. ---LUNCH AT “LA CASA VIEJA”/”THE OLD HOUSE” Protected content You’ll have 2h (free time) to enjoy the varied and delicious gastronomic offer of Alcala, but for this special day I strongly recommend (OPTIONAL) a restaurant for lovers of the traditional and categorical typical and formerly cuisine of these historical lands: “La Casa Vieja”, placed nearby the famous and stunning Plaza de las Bernardas into an ancient house with traditional furniture/decoration, where you’ll taste an assortment of luscious dishes (“raciones”) like migas ilustradas, homemade croquettes, torreznos (Spanish “energy light little bars”…), callos, piquillo peppers, morteruelo, mollejas, etc., and as dessert a typical sweet from Alcala, the famous “costrada”; all washed down with a recommended Castellan white/red wine + mineral water&coffee (included). HENCEFORTH, you’re free to continue discovering the interesting historic city centre of Alcala, walking along and visiting places like the University of Alcala ("La Docta", founded in Protected content the all powerful Cardinal Cisneros: Archbishop of Toledo, Regent of the Kingdom of Castile and confessor of H. M. Isabel I, "The Catholic Queen"), the Plaza de las Bernardas, the Corral de Comedias, the Archaeological Museum or, simply, taking a coffee in the pleasant Cervantes' Square. LAST SUBURBAN TRAIN to Madrid at 23:24h.